This beer is pure garbage. Thinner than water and I didn't think that was possible. Almost looks like iced tea. Not sure how this is even called a stout. Then just a slight hint of a Smores at the back end but it's pathetic. I took one sip and drain poured the rest. Disgusting. LOVE New Beer Sunday (NBS) with its inspiration to try something new & different each week. Today is NBS Week 672 & somehow, I am ensconced in S'mores. Strange. From the bottle: "Malt beverage brewed with natural flavor". I began to prise off the cap only to discover that it was another of these screwed-up screw-off caps! Grr. I took a deep breath before beginning a slow, gentle pour into the awaiting glass. Once sufficiently decanted, an in-glass swirl raised two-plus fingers of foamy, rocky, light-tan head with modest retention. Color was Dark brown to Very Dark Brown (SRM = > 27, < 34) with NE-quality clarity and mahogany highlights. Nose was super-sweet, super-chocolaty, more towards milk chocolate, plus a generalized sugary sweetness and with a pronounced biscuity maltiness. Phew! I am a hophead so this was delving into the deep end of the pool for me. Mouthfeel was thin-to-medium, not watery, but light for this style. Taste was very chocolaty. sweet like milk chocolate, but tempered with a coconut-like flavor as well as the biscuity maltiness noted on the nose. Finish was likewise sweet. It was a decent beer, well within spec for the style, but for me, it was a one-and-done. Black in color with a slight bit of light seeping through. There’s a fingernail of beige around the rim. I smell milk chocolate and marshmallow. I taste creamy milk chocolate and vanilla. The mouth is silky smooth. On tap. Poured an opaque, jet-black color with a small, khaki-colored head of foam. It smelled of smoke, coffee and chocolate. Nice sweet chocolate with a hint of campfire smoke. Tastes pretty much like it sounds. Not too sweet. Still...it's pretty good stout and worth a sip. Had on tap, second beer out of the keg...very fresh. LOOK: pour looks thinning for a stout. Cola black-brown. Quick fading head. AROMA: smells wonderful. Chocolate, marshmallow, vanilla, plus a hinti of smoke that makes you think you are at the fire roasting your marshmallow on a whittled stick. TASTE: tasty, but does not have the flavor that the aroma hints. Roasted barley and oatmeal outshines the chocolate or smoke. FEEL: thin for a stout, low carbonation. Medium body. OK. There are some things to like here, but ultimately poorly crafted. Easy drinking and tasty though. This beer was very very underwhelming. This beer does not qualify as a stout, maybe a lighter brown ale or a very light porter. It pours tan/brown with a light white head. 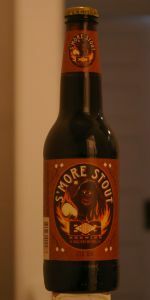 Mouthfeel was very thing and only marginally S'more flavored, if you tripled every ingredient in this beer, you might have something useful, but currently this is a very sad "stout". Dark brown beer with a rapidly fading head. Taste is chocolate graham cracker and sweet marshmallow. Thin body and highly drinkable. I would recommend to try at least once. This reminds me of a porter instead of a stout. It's very thin and has about 90% opacity when held towards the light. It's a much better version of the ShAkE chocolate porter IMO. Looks nice and dark and golden. Smell is quite nice! Taste is a let down it’s not rich or thick st all very easy to drink. Expect a stout to have more punch to it. Whatever flavor process was done to this beer was don’t way to little as it is weak. Wish it was done better as the slight taste is nice just needs to be more powerful!